Greenwich’s Francisco Liguori, left, and Norwalk’s Sebestian Echeverri jump for a header in the FCIAC high school boys soccer semifinal game between Greenwich and Norwalk at Fairfield Ludlowe High School in Fairfield, Conn. Monday, Oct. 30, 2017. Since 2005, Greenwich has won five FCIAC titles; Staples and Trumbull three; Ludlowe two; and Norwalk, New Canaan and Ridgefield one apiece. A few of those were co-champions. The point is, the soccer championship has not moved around much. In fact, since 2000, only Bridgeport Central (2004) and Westhill (2000, ’01) have cracked the safe and won championships. This year, the same group of contenders seem to be lining up for their shot at the 2018 title as have been the last 10 seasons. Danbury has the longest drought of our “teams to watch,” having last won the FCIAC in 1998. It is a bit surprising given how deep and talented the league is that the title has stayed in the hands of so few teams. Can a Wilton, Darien or Warde make a run at a title? Will New Canaan get back in the playoff mix with a new coach? Can a team like McMahon or St. Joseph improve enough to make a run at a playoff spot? New Canaan and Westhill did not respond to requests for information. There are a lot of questions coming in, but one thing is already known: Whoever can run the gantlet and win it all will have earned it. GREENWICH: The two-time defending champions lost some key players but bring back enough top-shelf talent to again be considered the team to beat in the FCIAC. All-FCIAC first-team midfielder Francisco Liguori is a strong presence in the middle, equally as dangerous on the tackle as he is on offense. The Cardinals also bring back forward Woojin Kwak and midfielder Chris Cruz as they look to become the first team to three-peat since Staples did it from 2008-10. STAPLES: Don’t look now, but Staples may be ready to get back on top of the FCIAC, having not won a league crown since 2010. Development Academy transfer Matthew Tanzer joins a plethora of returning seniors, including Nick Ambrose (MF), Gabe Baltierra (D), Ry Cohen (GK) and Vaughan Sealey (MF). The Wreckers also have a talented junior class and seem poised to potentially bring another trophy home to Westport. TRUMBULL: The Eagles lost in the FCIAC final to Greenwich and were stung by graduation losses, but if they can answer a few questions they should be right back in the thick of things. Captains John Michael (D) and Bryant Recker (D) are two of the three returning starters. How the younger players come along will determine how successful the Eagles’ season will be, but the team has shown the capability to reload. DANBURY: The Hatters are another team lacking varsity experience but have also shown the ability to develop players as the season progresses. One good thing for Danbury starting out is the experience it does return on defense, with Tyler Warren (left back), Alex Pane (left back/left mid) and Riley Moore (center mid) all returning to anchor what should be a stout defensive unit. NORWALK: Unlike most of the league, the Bears have nine starters back, including four-year varsity players Michael Hidalgo (F) and Matt Hernandez (F). Among the other players back are goalkeeper Gianluca Trofa and Lance Garcia (D). Norwalk is routinely a contender in both the FCIAC and in Class LL and with so many pieces coming back, the Bears should once again be among the league’s elite. 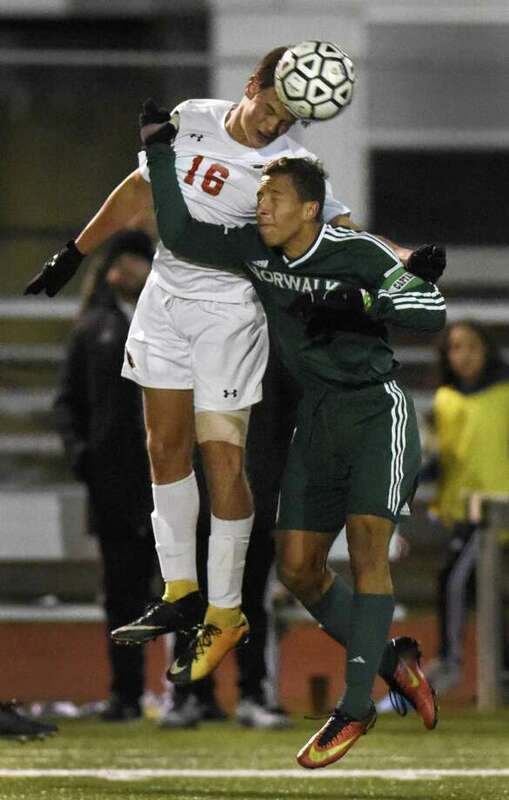 Jimmy Johnson, Greenwich, Sr. GK: All-FCIAC and All-State LL first-team selection, Johnson has established himself as one of the best keepers in the state as he enters his third season as a starter. Eli Pardo, McMahon, Sr. forward: Pardo returned to McMahon from academy soccer, scoring eight goals and being named first-team All-FCIAC in 2017. His combination of speed and strength are hard to match up with. Charlie Sears, Darien, Sr. defense: An All-FCIAC first-teamer, Sears plays smart, strong and understands the game very well, always getting himself into the best defensive positions possible. Austin Sholes, Staples, Sr. midfielder: A three-year development academy player is playing for Staples in his senior season. The Washington & Lee commit is a versatile defensive midfielder. Jason Weinstein, Trumbull, Sr. forward: All-FCIAC and All-State LL first-team selection, has tallied 29 goals over the last two seasons and returns as one of the most dangerous scoring threats in the state. Sept. 26, Staples at Greenwich: These teams do not like each other, and it shows on the pitch in the form of intense competition. Add the fact they are two of this year’s best teams and it becomes more intriguing. Sept. 28, Darien at Wilton: Both teams come into the season with questions but also track records of figuring it out as the season goes on. Both could compete for an FCIAC playoff spot this season. Oct. 10, Stamford at Norwalk: Norwalk brings almost everyone back; Stamford barely brings back anyone. Still, this rivalry is always intense and rarely disappoints. Oct. 17, Ludlowe at Warde: This crosstown rivalry has been heating up in recent years and this edition could be the most exciting game yet. Both teams will likely be jockeying for postseason spots come mid-October. Oct. 23, Trumbull at Danbury: The regular season closes with what could end up being a crucial game for two teams with serious postseason aspirations.